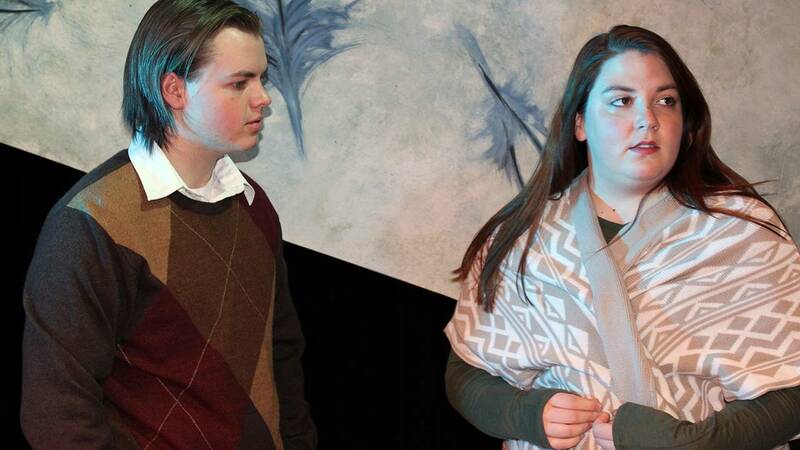 Chance McDonald and Talia Crist star in TheatreAC's "Afterlife"
"It's surreal and too weird for words." Amarillo College theatre professor Ray Newburg isn't usually at a loss to describe a play, but Afterlife: A Ghost Story, TheatreAC's season-ending drama, isn't a typical show. The Steve Yockey drama — which opens at 7:30 p.m. Thursday in the AC Experimental Theatre — examines the lives of a married couple, Connor (Chance McDonald) and Danielle (Talia Crist), who appear to be boarding up a beach home ahead of an impending storm. But the real turbulence lays below the surface, as it becomes clear that the couple has suffered a significant loss and is struggling to deal with the new reality of their lives. "He's so far ahead, and she's so far behind" in moving past the loss, McDonald said. "He didn't take the time to feel the emotions." And that's when reality goes out the window. "The second half of the show is pretty wackadoo," Newburg said. "Theater aficionados will appreciate it. It's very theatrical, very stylized." Crist agreed: "The second act is off the wall." SPOILER ALERT: The couple enters a purgatory-like realm in the second act, confronted by talking birds and physical reminders of the loss of their young son. "I like weird, and I thought this was not outside (the students') capability to do," Newburg said. "This has let them play, go wild." But despite the surrealistic elements, at its core, Afterlife is a story of deep, soul-searing loss. "It's hard," Crist said. "I've experienced (deaths of close relatives) before, so trying to draw on that without drawing too much is a challenge. ... I would come home from the table reads just emotionally drained." Afterlife: A Ghost Story will be staged at 7:30 p.m. Thursday through Saturday and 3 p.m. Sunday in the Amarillo College Experimental Theatre on the Washington Street campus. Tickets are $8 for adults and $6 for seniors, students and AC students, faculty and staff. Call 806-371-5359 or visit www.theatreac.org.